Home › Alison Haislip › Ninja Warriors! Mt. Midoriama! Cosplay! Tokyo Lights! 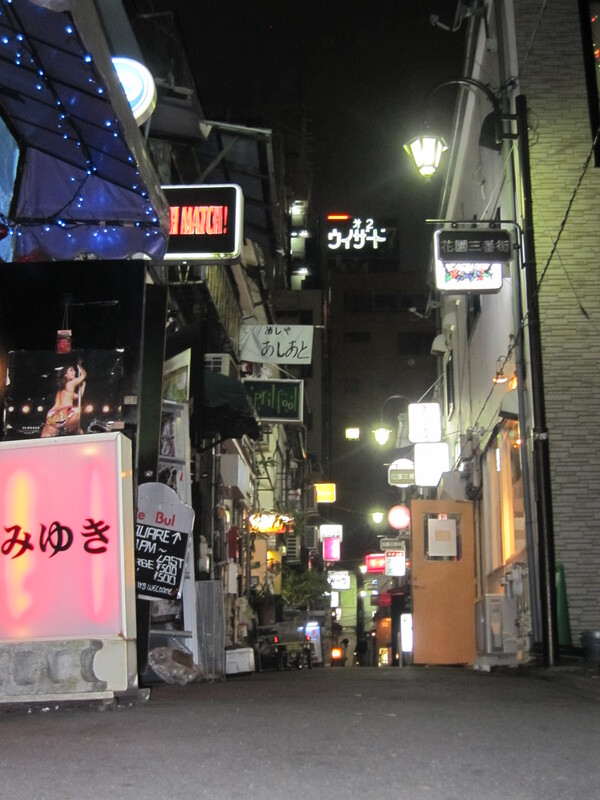 Tokyo Nightlife! Ninja Warriors! Mt. Midoriama! Cosplay! Tokyo Lights! 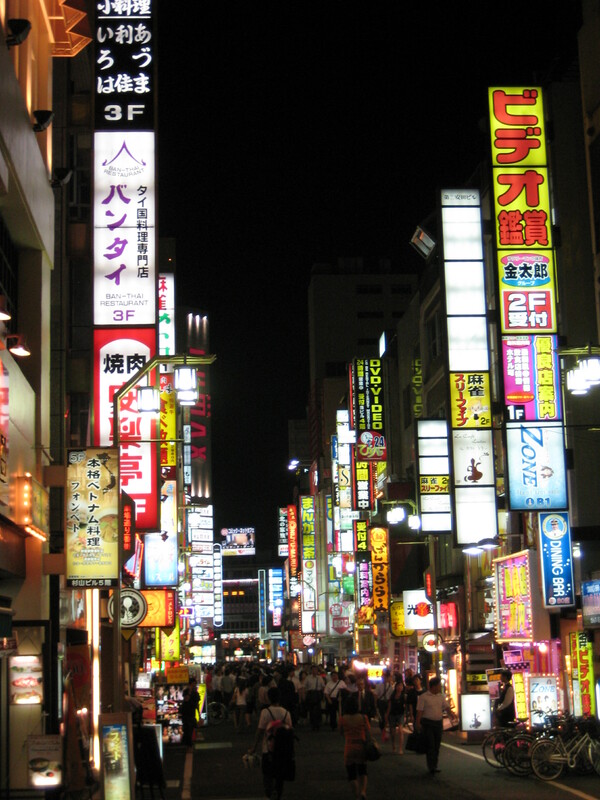 Tokyo Nightlife! I love Tokyo. It is a city full of the nicest people, the brightest lights, the freshest fish, and the coolest Ninjas! Yes, I love Ninjas – I’ve had the opportunity to travel to Tokyo four times in the last three years – each time to attend the taping of “Sasuke” – known on G4 of course as “Ninja Warrior”. 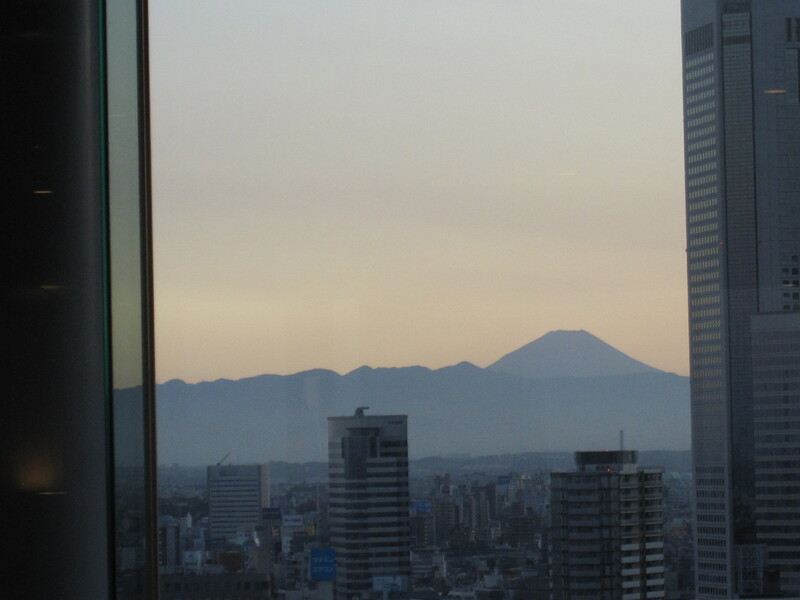 Any trip to Tokyo includes a visit to the famed MT. MIDORIAMA! OK – it’s not a mountain at all, but this is the 27th running of “Sasuke”and it was the most exciting “Ninja Warrior” ever…I was lucky enough to attend the taping – here is what it looks like to be on the set at night, when logs are set ablaze to provide warmth at 4am – as filming continues all night long! As a tribute to our upcoming show, I wanted to share some pictures and memories of Tokyo. One reason you see such an amazing skyline in Tokyo – because everyone lives on top of each other! Here’s a fascinating fact: 150 million Japanese people – half the population of the US – live on an island the size of Montana! The Japanese do it so well – Cosplay (コスプレ kosupure? 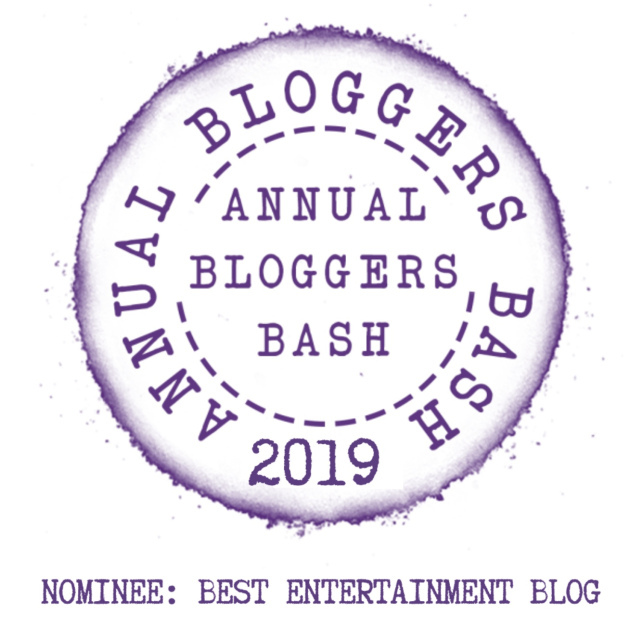 ), short for “costume play”, a type of performance art in which participants don costumes and accessories to represent a specific character or idea. Characters are often drawn from popular fiction in Japan, but recent trends have included American cartoons and science fiction. You can also find Cosplay cafes, where you can sit among the dressed-up characters, or be served by them. Either way, it’s a unique experience. DOUBLE DECKER CONVEYOR BELT SUSHI! 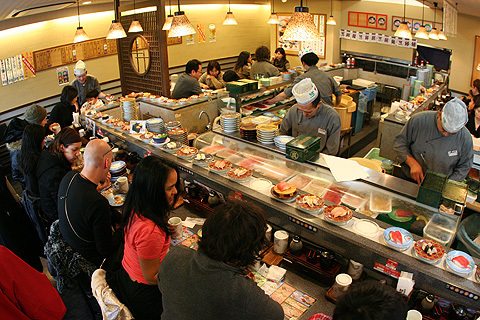 Kaiten-Sushi, or revolving sushi is very popular in Tokyo. When you get inside the restaurant, you are guided to a counter seat. In front of you will be a conveyor belt with sushi circling around. You can chose any sushi plate you like. Keep the plate on your table, because when you finish eating, the waitress will count up the plate to know how much you have ate. Now on to the world’s largest Fish Market! The world’s largest fish market is in Tokyo – and I have had the pleasure of filming there and eating there as well! The market is actually a breeze to get to: located near the Tsukijishijō Station on the Toei Ōedo Line and Tsukiji Station on the Tokyo Metro Hibiya Line. There are two distinct sections of the market as a whole. The “inner market” (jonai shijo) is the licensed wholesale market, where the auctions and most of the processing of the fish take place, and where licensed wholesale dealers (approximately 900 of them) operate small stalls. There were plenty of places to buy finger food – such as these fish sausages on a stick – which I was all set to buy, but got distracted by a series of tiny tiny tiny food stalls that were serving all of the fresh fish being cut up inside the market. So, the process is easy: find a stall with an open seat, sit down, and then order something. What? Can’t understand the signs? Well, there’s not much you can do about that – there isn’t much english being spoken here…but what you DO have is spirit – a friendly people who are honestly interested in helping you order – no matter how difficult it might be! The “outer market” (jogai shijo) is a mixture of wholesale and retail shops that sell Japanese kitchen tools, restaurant supplies, groceries, and seafood, and many restaurants, especially sushi restaurants. I ate breakfast at the fish market three days in a row – three days of sushi, sushi, sushi. Each stall is operated by master sushi chefs…and older Japanese women who, in my case, served me a bowl filled with yellowtail, sea urchin and rice. They spoke NO english, there were no english menus, and they were, I think, afraid that I was ordering wrong – and since I didn’t speak Japanese, and they didn’t speak english, they just yelled louder at me! On A Clear Day You Can See Mt. Fuji! I cannot enough enough great things about the Japanese people, and I wish them well in their recovery…and cannot wait to go back. ‹ Classic 70’s Cinema – UPDATED!